H2O Softwash uses only the Asphalt Roofing Manufacturers Association (ARMA) approved method of cleaning roofs. Our process uses a sprayed chemical solution that has proven to be both effective at removing algae and safe to the surrounding environment. Our roof cleaning solution is contained and controlled to protect your property at all times during the process. We do not use high pressure cleaning during any part of the roof cleaning process. All roof stains will be removed by the time we leave the job. Any roof moss left behind will be dead and will fall off after a few heavy rains. If you have moss or lichen and want it removed immediately we can scrape it off, but it is not recommended as it pulls granules off the shingles with the roots. We recommend that moss and lichen be left to break at the root level after it is treated. We do not rinse the solution off because the solution is still active and continues to work hours after applied. The longer it is left on the roof the more effective it is, as a preventive measure against future growth. Not rinsing saves time and money for the homeowner as well as saves water in the process. Once the solution becomes inactive it is simply salt left behind. The chemical solution that we use has been found by 3M Corporation and the Asphalt Roofing Manufacturers Association (ARMA) to be the most effective and safest method to combat the growth of Gloeocapsa Magma algae, Moss and Lichen on residential roofing shingles. We look forward to returning the roof of your home to it's original color and condition. Call / txt or email us today for a FREE ESTIMATE!! * What are the Black Streak on my Roof? The most common culprit causing the black streaks on roofs is a black algae called Gloeocapsa magma. That's right! You have organic matter growing and feeding on your roof! Over the past 30 years this algae has become more aggressive and has migrated via spores released into the atmosphere to cooler less humid environments. It has has become a fairly common sight on asphalt shingle roofs across most of the Country. This ugly growth usually occurs on the north or west side of the house as well as the tree shaded areas of the roof. As the algae grows and spreads, it holds moisture, which accelerates its growth. * Is this Gloeocapsa magma algae dangerous to my roof? Yes, algae growth on your roof causes several problems over time. First of all the algae is usually black in color so it absorbs the suns rays, heats the roof surface quicker and leads to higher cooling costs. As if that were not enough reason to have it removed, the algae on your roof is actually eating your shingles! This strain of algae feeds on the limestone used in the manufacturing of todays roof shingles. Over time the granules protecting the surface of the shingle begin to loosen and wash off as the limestone is diminished. Algae present on roof shingles promotes other damaging biological growth such as lichens and roof moss which are even more harmful if left to grow and spread. Roof moss and lichens anchor into the shingles and spread even more quickly then algae. Moss and lichens grow up into and under the shingles and along edges causing them to lift and make the roof more prone to wind damage and leaks. This destructive growth acts like a sponge that keeps the roof damp causing even more and faster growth. Premature roof replacement could cost you many thousands of dollars. Removing the stains and growth early is your best option. Don't wait until the entire north side of your roof is black, it may be too late and some damage to your shingles may have already been done. * How do I get rid of this destructive algae, moss and lichen? Professional cleaning with environmentally safe solutions and very low pressure are the best answer. H2O Softwash uses only safe, non pressure system for cleaning roofs. The chemicals do all the work. We systematically apply the cleaner and then wash away the algae to a clean, new looking roof. A thorough roof cleaning adds life to your shingles, and value to your home. * Will my roof look clean when H2O Softwash is finished? 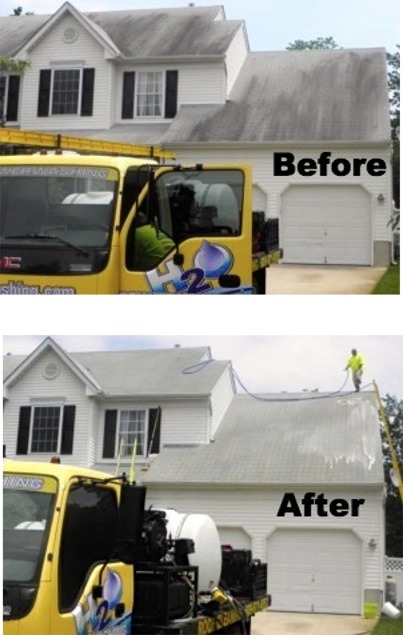 Your roof will look almost brand new when H2O Softwash finishes the roof cleaning job. The unsightly black streaks will all be gone from your shingles when we are finished. Any spots of heavy lichen will die and change colors but could remain visible for a week or two after cleaning. Lichen's roots take a very strong grip on your shingle granules and need some extra time before it will release from the granules. * Can Natural Wood Siding be cleaned, sealed or stained? All natural woods must be cleaned properly then rinsed without pressure. With over 20 years experience with all types of wood siding in the Northeast, H20 Softwash will clean your home without damaging the wood. We offer sealing and staining services as well. Clyde Sampsel the owner of H20 Softwash would be happy to give you a Free Estimate! H20 Softwash would be happy to provide you with a FREE ESTIMATE for any of our cleaning, painting or staining services. Please call or complete the Services / Estimate Form. We have been in business for 20 years! We are fully licensed and Insured, documents available upon request.